And I’ve had these privacy screens as my window treatments for my large picture window forever. 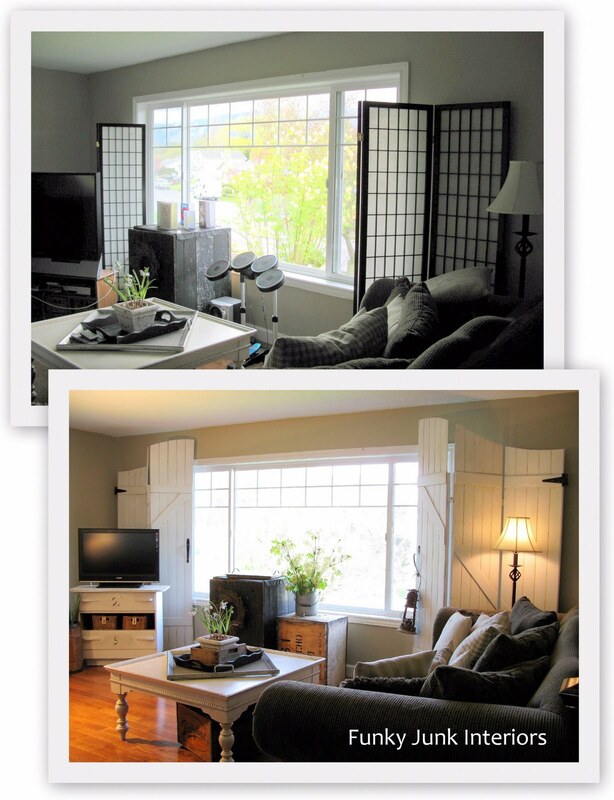 But it wasn’t until I created old wooden gate window screens out of them, that I truly fell in love. 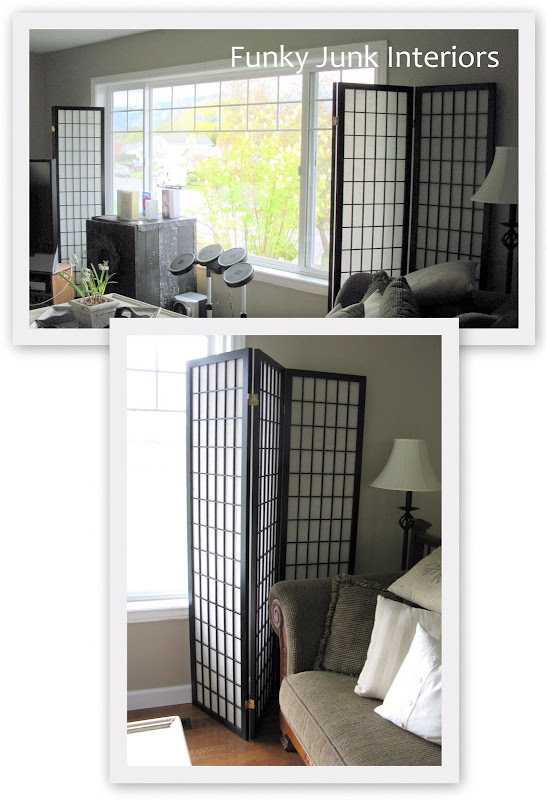 I much prefer screens in our home over curtains due to pet hair, however I always had visions of making them look like old gates. Working from this inspiration just down the road, I liked the curvy top and came up with a plan. This wood fit perfect! The slats are 3.25″ wide and the boards are very thin, which was important so the framework remained as lightweight as possible. Using vehicle pin-striping tape, I created a curve along the top. I then followed along with a pencil line and cut through the boards with a jigsaw, then sanded the edges with a palm sander. The screens then received a bonding primer, semi gloss white latex paint, then a glaze. The glaze was simply made with water and a deeper colour latex paint. It isn’t the right way, but I was in a hurry and it works in a pinch. Brush on, wipe off with a damp rag, leaving darkness under cross beams etc where natural shadows would occur. A rusty old lantern was mounted on the inside of the gate handle for a little extra rustic outdoor charm. And here’s the finished result! Welcome to my cottage style old gate window screens! Light and bright, and casually charming that would suit most any decor. The two gates resemble one large entry gate, appearing as if it was simply carried it into the house and propped in place. They provide lots of impact, but in a texture kind of way, as the white just adds brightness to the room. The curvy tops add some architectural interest to an otherwise very square window frame. Here’s the closed version. We rarely close them anyway, however if we wish for extra privacy or block out sunlight when watching a movie, the option is there. Felt liners run along the bottom of the screens for easy shifting. I am in love!! You did an amazing job!!! You are AAAAMMMMMAAAAZING! Love, love, love them…want them for my own! This is one impressive project! I love it! The new screens/window coverings are beautiful!!! What a difference. You are soooo talented and your execution of these gates is amazing!!!! but i’m not surprised coming from you. in love with the “gate” look. so unusual, but works & LOOKS so well. i feel a gate window treatment trend coming on! in almost every post of yours, i shake my head in amazement or my mouth automatically drops open in awe. – just so you know! This is INCREDIBLE. I love it. At first I wondered but sure enough, you knew what you were doing. Wow, these are wonderful!!! What a creative idea…and cute too. I am always in awe of how you come up with these great projects. What a great project, I love it! Each week I find myself sitting here starring at your project thinking to myself, she did it AGAIN! Wonderful Donna! what a great job!!!! Going to vote now! You did a great job! 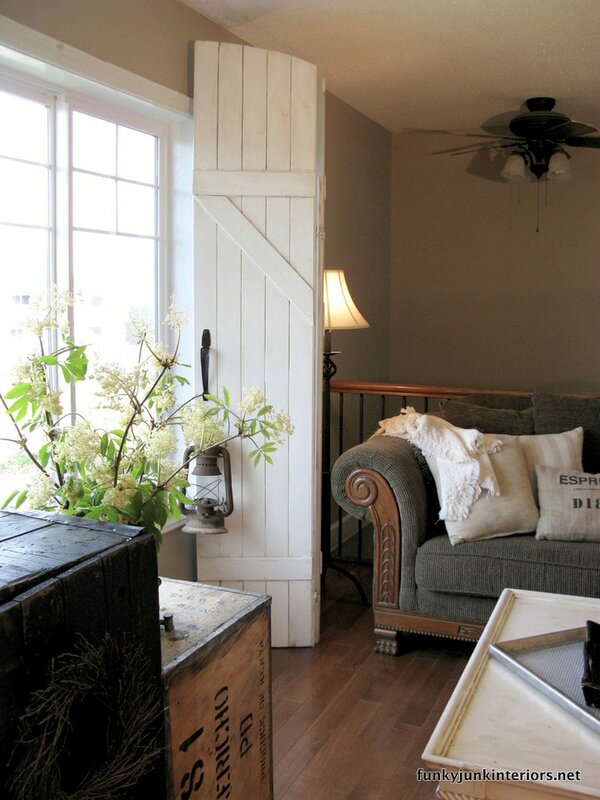 Love the antique feel of this “gate” window treatment. You would never guess under $100 bucks! I love it! Those are gorgeous! I love it! We don’t have curtains because of all our animals. Great idea! Yes, you are worth it! 🙂 I have been wanting shutters for my windows, but they would have to be custom because of the size, and that is not in my budget. I could totally see your technique working for me. Do you want to help me with that when you come over to do the stairs? 😉 And my shed is finally done so you would have a place to work. And I will bring in a palm tree if it would help. 😉 You are over the top once again in design and inspiration. Love it! SHut up! Amazing. I love the look. You have inspired! I follow a lot of blogs and I must say, that is one of the coolest things I’ve seen thus far. I want one! I LOVE them! What a lovely addition to the space. I Think these are awesome.. love them.. a looooot! My mouth is hanging open! You’ve out done yourself again! These fit so much better with your style. Great job, Donna! I am in awe. Seriously these are amazing. You just keep getting better and better. Fantastic idea, you have such incredible ideas. Wow… you are A-mazing! That rocks! Donna- you have the best projects. LOVE it! Great job! It’s wonderful! I love the curve of the screen and the details you added to make it look like a gate. You are so talented. You never disappoint ! Fabulous job on those gates. They really are perfect for your room! Another amazing accomplishment! WOW! WOW! WOW! That is incredible Donna! Wow! Girlfriend! Where are you coming up with all this awesomeness?! I hope SYTYCD never ends so we can keep getting all up on THIS. Seriously, you should be on tv. I am in awe of these ideas you come up with. Just awesome! Feel free to come try some projects at my house! You have reached the pinnacle-PERFECTION!!! you are ridiculously talented, and have such a great vision for things. the gates look fantastic, and good luck on SYTYCD! donna, donna, donna…these are so awesome!!! i’m curious…what does the other side look like? did you paint the black frame too, i’m assuming you did? What a great idea! I have two old doors in my house for decoration and am about to take a third and make a sideboard. There is just something about old doors and gates that just are so welcoming! That is incredible! Those are so more you than the ones before. I love how they look. A big improvement. I wish I had half your talent and creativity. Goodness you sure know how to make a DIY chick feel good! 🙂 Thanks so much! #40 Judy, yes, I did paint out the black screen on the back and the onion paper on them was already white. But at some point I’d like to remove that cloth stuff and spray the backs in white. I’m addicted to old doors and windows, and I really love this idea. Great job! once again I am blown away and totally in love with your project!! Holy Stinkin’ Cow! You are so creative…it blows my mind! Thankyou for sharing! Get Out! that is wild. You never cease to amaze!… I am just shaking my head in disbelief. Who would have thunk to do such a thing? Only you Donna, you have an amazing mind and a knack at making the wildest ideas come to a perfect reality. You totally ROCKED this one! I have to catch my breath. Those are amazing and beautiful and I so want some now. You are such an inspiration. I’m still trying to catch my breath. Incredibly awesome!!!!! I can’t stop oooohing over them! Oh my goodness perfection! Love Love Love it! What magazine do you design and create for, again? Oh yeah, “they” should be calling you any time now! A simple, “THOSE ARE FABULOUS” is so trite, but oh my gosh they are!!!! Beautiful!! I love it.. Your ideas are just the best… :O) I love your decor!! Okay, so..do you know how cool you are? What a wonderful and beautiful idea, Donna!!! These are so awesome!! I love them. They are perfect in your room. And your tutorial is so easy to follow. Thanks and a hearty “well done”!! Totally breathtaking! They look beautiful in your room! OMG these are so awesome!!! I LOVE LOVE LOVE them and they look fantastic in your room! At first I wasn’t sure but WOW. They are amazing looking and a totally different look for the room. Great job!! These are amazing!! You always give such great inspriation. Thanks! wow!!!!! awesome!!!!! love, love, love them!!!!!!! That is one of the best blog creations I have ever seen (someone did some crate stairs that were tied with this!!). Donna, you should be writing a book, or be submitting your things to magazines. This is seriously fabulous and original stuff you do! They look amazing! What a great job you did! LOVE IT!! oh my goodness……..that is THE coolest thing I have seen in awhile! Oh my gosh, that is positively perfect. You’re so creative and the end result is gorgeous. I just came by to say hi, and let you know I am praying for you. But look what a nice surprise i found. These are wonderful!!! What a difference! Just fits your house so well. Off for along walk, before it reains i hope. Hey Donna,, i love your old gate window screen,, and it looks more like your style than the previous screen,, it suits you! This is awesome! How do you come up with all of these ideas? They are fantastic. You are very creative! #78, I’ll do a post on that very topic soon. I get asked that alot so I’ll take you through my process. Fantastic Donna, absolutely fantastic! This weekend I was looking at my curtains and sheers which are only three months old but look older thanks to certain feline members of my household and was wondering what I could put in front of my picture window. I love how they look but it seems no matter what I put on that window, the critters end up destroying. Blinds? Forget it! I have spent a fortune on replacing blinds over the years and when I began remodeling my home, I swore I was not going to put up more blinds. That window faces the street so I do have to have something to close for privacy in the evenings. I like your idea and, if possible, will copy it or do something similar. I wish I could let you loose in my house and give you free reign to create to your heart’s desire! I love your sense of style and that you are not afraid to try anything. I am still in awe over the painted crate stairs. I absolutely love them! You’re absolutely ridiculous. I cannot believe how talented you are! I wish I had a tenth of your talent and eye. You are my dream decorator! Is there anything you CAN’T do? What a great idea and fabulous outcome! I think I’ll spend my next vacation at your house because it is so wonderful. Once again may I say WOOOOOOW! I am headed to vote for you right now! And then maybe go work on a project of my own!! Your so inspiring! Is there no end to your creativity?! The gates look fantastic and what a bonus that they can actually be closed. Can’t wait to see what you come up with next. You are just ” TOO SCARY GOOD!!”!! Wow! You totally just got my vote this turned out so amazing!! Those are the absolute best! What a great job and good artistic eye you have!! Still thinking about you and praying you are doing well every time I see a post. Another completely amazing and inspiring idea, Donna. I just love how they turned out! The room looks completely different now. Donna, these are just the best! You did a marvelous job and I just may be borrowing this idea!! Aren’t nail guns so slick? Sorry to hear about your Mom…your strength is amazing and inspiring…just like your mad carpentry/blogging/design/decorating skills!! I wanna be just like you when I grow up. I just brought my hubby over to see….had to leave another comment! hehe I am SO in love with your style! If I had a place to use these I would make me some! WOW! I absolutely love this! Love, love, love this idea of yours. You see, I have got to do something about window coverings in my house. Thank you for sharing. Wow! First the stairs, now this! Keep ’em coming! I have to say… You are one of the most CREATIVE gals I ever saw! Wow!!! It’s so beautiful! Great Job! Absolutely beautiful and very inspiring. They look amazing in your home. I love your work! Holy Cow! They jsut totally MADE that room complete! I cant figure out why you’re not being featured in any magazines. Seriously! Maybe after this trasnformation someone will get smart and publish you! Donna, your home is an absolute inspiration as are YOU!!! I LOVE your ideas and MUST visit your blog every day!! Would you be willing to post a layout of your home? I have a split entry home and I think you do as well. It is hard to envision the whole house and how it fits together! Thanks for considering this!! Keep up the great work!! Oh Donna, you are simply amazing. Those gates look incredible. It’s one thing to see it in a photo, but I bet it’s even more COOL in person! Great job. Brilliance once again! I love this. Love the hardware and the lantern hanging there is perfect. This is brilliance! ONe of my most favorite projects of yours!!! Great job! This will “win” for sure! Such a wonderful project! I absolutely love it. I featured it today on my blog! Crazy amazing! Creativity at its best. I am looking at my Arcadia door and thinking how great these would look there:) You are an inspiration. Keep it up. donna… that turned out incredible!!!! i would just sit in that room all day long admiring its beauty! These are totally amazing ! I am beyond impressed. Must tweet right now ! This is off the hook FANtastic! Seriously, one of your best projects EVER. Love this! Always on the hunt for a deal, I too love the challenge of making it myself, but this goes way beyond the causul DIY’er. Fab job! You should get a patent on those, girl. That’s fabulous! Very creative!!! Love these… you sis a fabulous job! Donna, you are amazing, girl! I LOVE LOVE LOVE this! I want one. They look amazing! I wish I had a place to put some! I just love everything you do! I love this idea! 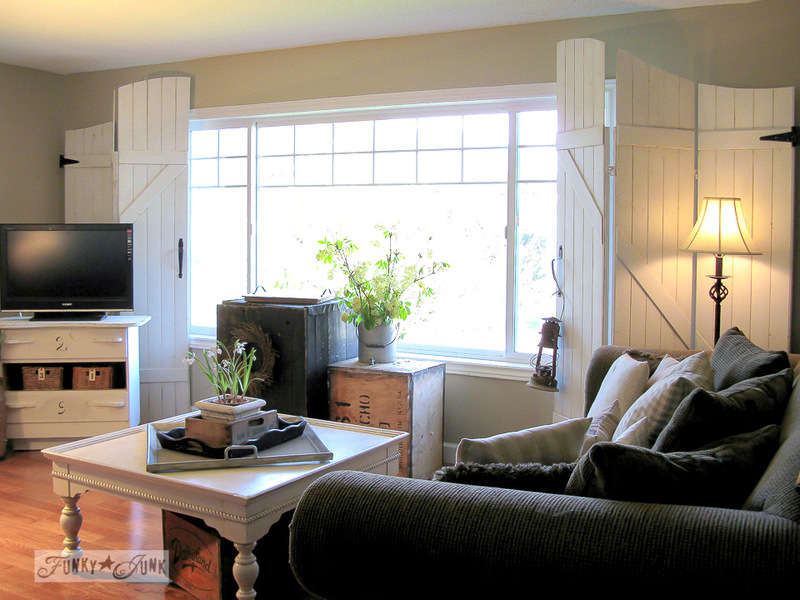 Such a clever solution and they turned out absolutely beautiful, adding so much character to the room! great job – I L.O.V.E these – they look like you paid a fortune for them 🙂 Now I just need to figure out where I need a pair! LOL keep up the great work! So cool, you are amazing. Wow I just found your blog. I’m speechless. I have been a blog stalker for a long time and I thought I had seen it all until now! You are incredible! Stunning!!! Just stumbled upon your blog – always looking for great ideas – will be back! ummm yah, these are FAB. Gosh, great job! love them!! Gorgeous! They compliment your other furniture so well too. This project is one of my all time favorites EVER. Big loves! Thanks so much for linking up to The CSI Project’s hardware Store Challenge! We hope you will come back next week for the Martha Stewart-inspired challenge — The MS Craft Department are our guest judges!!! If I haven’t already commented on these then I have to say…I love them! They gave me an idea for closet doors that I want to make. I blogged about it and posted your screen on my blog with a link back to you. The wooden gate screens look amazing! I adore this idea. So creative. I will be linking to your amazing screens. Thanks for sharing. I’m in love. These are spectacular! Must put on the to-do list! Just found your site and will follow you often. Would like to know where you got the planks to make these screens. I have looked on line and could not found them. Love your project and would like to make one for our home. 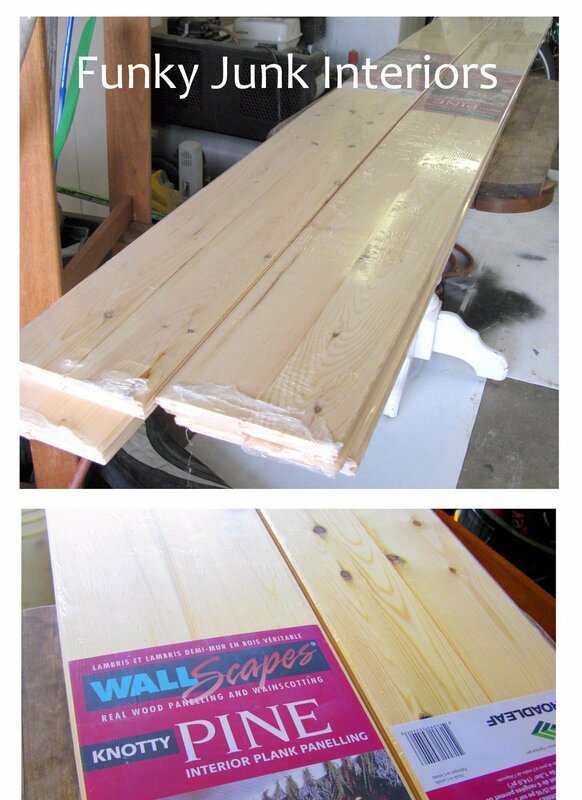 #136 Anon, the planks were picked up at either Rona (in Canada) or Home Depot, I don’t remember! 🙂 It’s just tongue and groove pine planking that comes in packages. Often used for ceilings, creating paneling or walls. Very lightweight and easy to work with. These are just so awesome. I just keep staring at them and calling to my husband to look at this stunning invention. We don’t even have a window like that, and I am trying to figure out how I can utilize this great idea in our home. Thanks so much for sharing! I am truly amazed. I just love these old gates. I think they look better with your interior. I love the cozyness of this room but it’s still so open and bright looking. Hi there…I’ve been on your site before, but never so thoroughly as today. 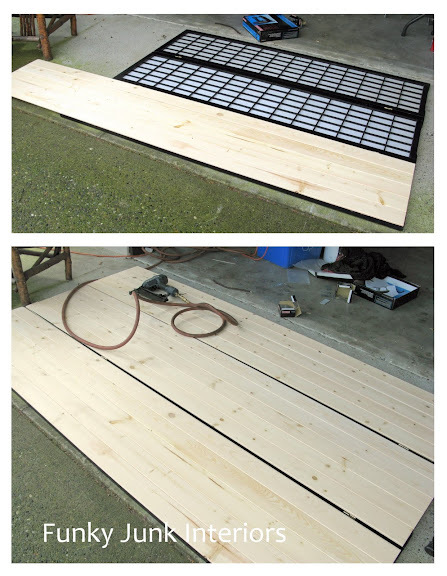 I have that same screen you made into window shutters…very ingenious! You’ve got me thinking about my own idea for shutters in our bedroom…Thanks! donna, you are DA BOMB !! Love the shutters at the window, and the fireplace. If it was me I would of put the tv in a cabinet to hide it. Gorgeous job!! Just the incentive I needed to tackle the shutters in our living room!! We love screens and this is a great new take! YOU are my kind of designer!! Thinking outside of the box, fearless, and creating amazing, unique, fantastic products. I love everything you do!! !Congratulations on all your success. So very impressed! Your creativity is inspiring! donna, these wooden gate window screens are fantastic! They do fit your home style so much better than the privacy screens. I’m going to add this to my FunkyJunk list of things to do! You have some really great creativity! I just happend across your blog due to pinterest. Great stuff here! I’m so loving this idea, hoping to talk the hubby into doing this in bedroom to keep the dogs out. I love the doggies, but we need our space. Oh my, Donna! You are right!! These are the mama to my ‘lil kitchen shutters! I LOVE these sooooo much!!! Where did you get the privacy screens to start and how much were they… This is awesome! OMG I’ve been driving myself CRAZY thinking of a way to get more wall space in my Kitchen/Dining area!!! We bought a house 6 yrs ago that was built in 1964 & two of the largest walls in the kitchen/dining area are nothing but windows that are only about 20 inches from the floor. Our kitchen is tiny, has a lack of counter space etc, I was thinking of closing up the largest picture window 102″ across, so I could put cabinets on that wall however it created a BIG issue. The outside of the house is brick we wouldn’t find any to match, we were looking at a large expense in painting the brick etc. with your idea I can create the gate put a long dresser in front of it & not worry about it looking tacky on the outside!! YAY you’re my hero..BTW I HATE this house (long story) I’m determined I can learn to love it if I keep looking at other people’s inexpensive ideas to fix it up!! Thank you!!!! I LOVELOVELOVE the brightening effect it has on the room. Sweet job! I LOVE this idea! I have 2 sets of sliding glass doors that drive me nuts and lose tons of heat in the winter and bake you in the summer. This would be an incredible way to combat those problems! I love your blog and inspiring ideas. You know very few people do what they love, something like 3%. Scary sad, isn’t it? What part of the world do you live in? My husband and I live in the Pacific Northwest of the United States. Anyway, thanks again for sharing your grit and gumption. Hi Donna, yes, that’s exactly what I did! But because I never close the screens, the backs never show to the outside. If you wished to close them and have the backs show, you could always cover the backs with wood or just paint it out the same colour I’d think? Wow! I’ve been looking to get bypass plantation shutters for our patio door, but this is preferable in cost and appearance. Thanks for the inspiration – what talent you have! 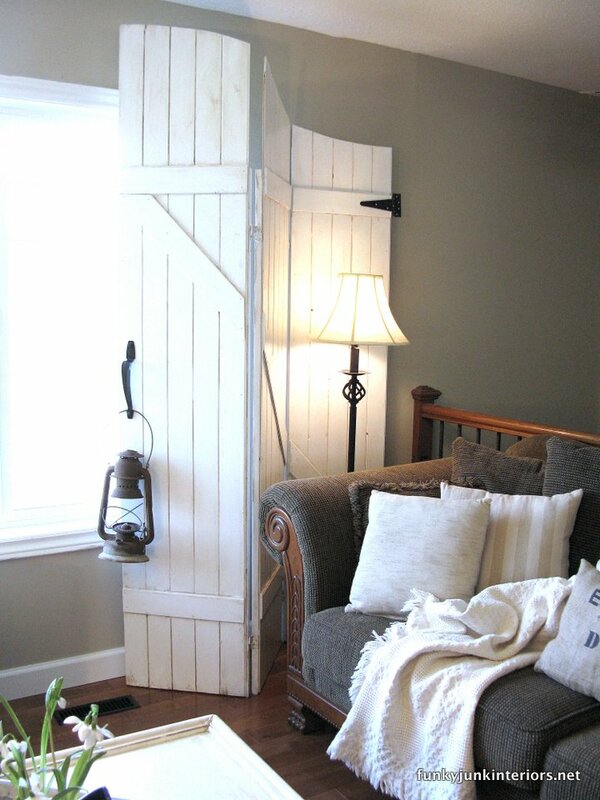 I have been looking for old Barn doors for a while now, now I can make my own. Unbelievable!! Thank you so much for taking the time to show how you created them!! 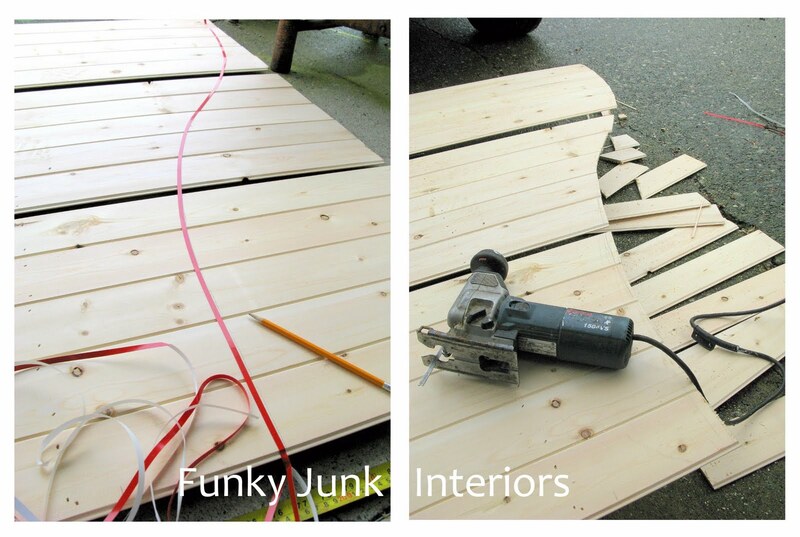 This is ingenious….I admire your vision and abilities with all kinds of tools…you have so many wonderful ideas….it really isn’t funky junk…it’s truly AMAZING. These are great and ditto to all the other comments. I do have a question though…what does it look like from the outside of the house. You stated that you nailed the panels to the screens which were black. I just wondered what it looked like. The inside is over the top. Great job. Oh my!!!! Thank his alternative to curtains is fantabulous!!! What is the exact thickness of the tongue and groove boards that you used on the bathroom ceiling. Hi Violet! I don’t remember off hand, however it was pretty thin stuff. Perhaps .25″ thick? The thinnest sold. I love this! I want non-lazy me to make an appearance and make these for my French doors. Unfortunately, lazy me almost always has control.